Elements of open-air living are inherent in West Coast design, especially in southern California, where the temperatures are mild and the sunshine plentiful. In Los Angeles, nature prevails, and just as residences fuse inside and outside spaces, so do museums – albeit on a grander scale. Existing as more than repositories, LA’s art institutions offer gathering spaces for the public to enjoy at almost any hour of the day without requiring access to ticketed galleries. You could say that Los Angeles County Museum (LACMA) functions as LA’s unofficial town square. The Wilshire Boulevard entrance to the largest museum in the western United States is anchored by a large-scale illuminated installation by the late Chris Burden. Called Urban Light, a collection of 202 antique lampposts from various neighbourhoods in the LA area, it is by far one of the city’s most visited landmarks. You only have to search #urbanlight on Instagram to see how it photographs from day to night. Embodying LA’s past and future (a recent Leonardo DiCaprio Foundation grant retrofitted the posts with power-saving LED incandescent bulbs), Urban Light ushers museum visitors and foot traffic into LACMA’s 23-acre park. 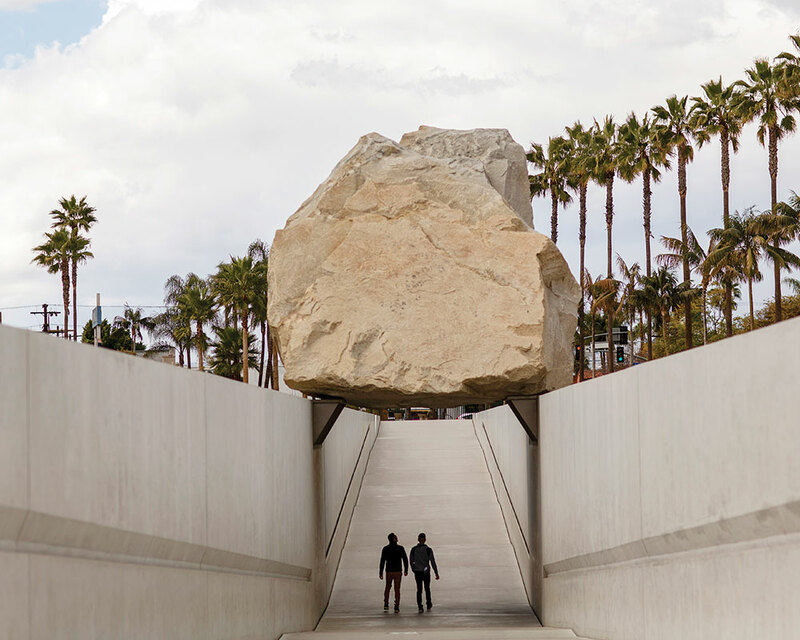 Here is Michael Heizer’s Levitated Mass, a suspended 320-tonne boulder; Ray’s & Stark indoor-outdoor restaurant and bar; and spacious grounds that host exhibitions and public programmes throughout the year including a summer line-up of jazz and Latin music. Lining the Kendall Concourse is an installation of palms created by artist Robert Irwin. He worked alongside Renzo Piano – architect of the newer wing’s Broad Contemporary Art Museum and Resnick Pavilion – to produce a Palm Garden that adds distinctive LA flair to LACMA’s outdoor living room. 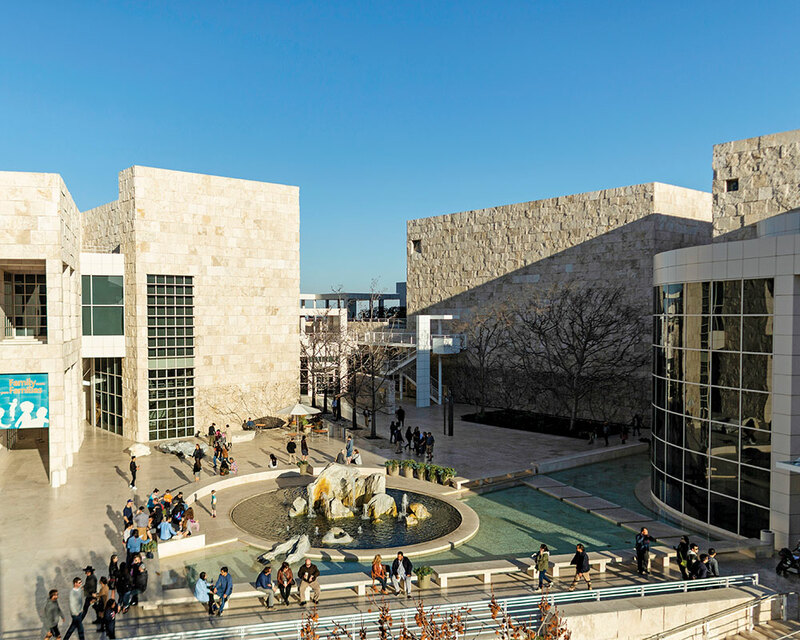 Prior to his commission by LACMA, Irwin worked with the Getty Center, a complex of buildings designed by architect Richard Meier. Perched on a hill in Brentwood overlooking downtown LA all the way to Santa Monica Bay, the museum includes in its catalogue of art works Irwin’s Central Garden. Since the garden’s unveiling in 1997, it has changed continually, as seasonal plants are added and subtracted to the ever-evolving palette. The museum’s travertine exterior stands in stark contrast to this living art piece that is highlighted for its focal pool of floating azaleas and sprawling pink bougainvillea arbors, which provide visitors with places to rest, picnic, and enjoy the sweeping LA views. By the garden’s adjoining lawn, the museum courtyard comes alive after-hours with scheduled annual events, such as Getty’s Off the 405 summer concert series and Friday Flights. 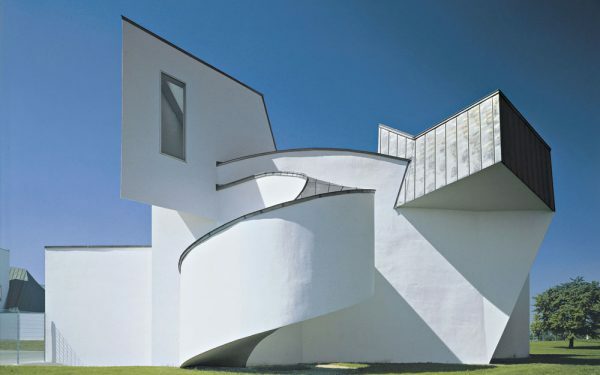 The latter invites artists to interact with Getty’s architecture and gardens and “forge new connections with the collections and exhibitions through music, performance, film, and other creative interventions”. 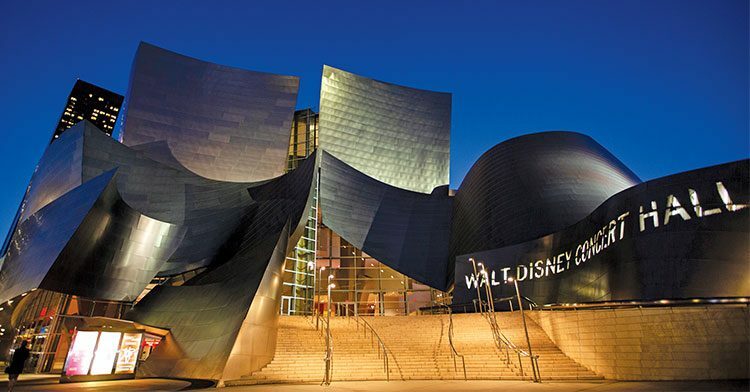 From the Getty, a 30-minute drive down the 405 and I-10 freeways leads to downtown LA, where The Broad has revitalised the Grand Avenue corridor (also home to The Museum of Contemporary Art, Los Angeles, and Walt Disney Concert Hall). The museum’s eye-catching white honeycomb exterior veils three levels of galleries featuring works from Andy Warhol to Jeff Koons and a storage area containing the philanthropist Eli Broad’s expansive contemporary art collection. It has drawn queues since opening on September 20, 2015. What requires neither reserved ticketing nor waiting in line is its adjacent 24,000-square-foot public plaza. Like The Broad, it was designed by New York architectural firm Diller Scofidio + Renfro, who collaborated with landscape designer Walter Hood of Oakland’s Hood Design Studio. The pedestrian-friendly space, shaded by a canopy of 100-year-old Barouni olive trees, offers green spaces, plenty of seating, and an event lawn. 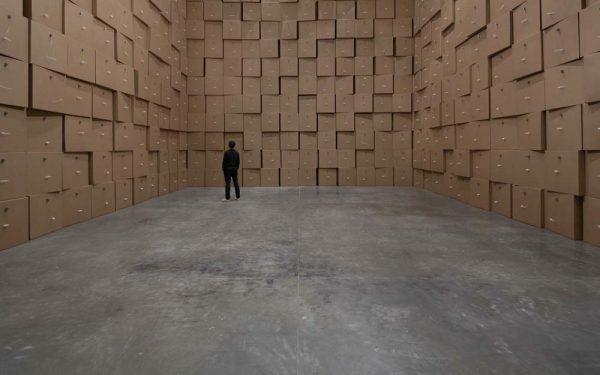 The Broad’s Summer Happenings late-night music, performance and art programme, whose headline acts this year include Baltimore music duo Matmos and EYE (July 28) takes place in this expanse. And there’s also Otium, a standalone restaurant helmed by Chef Timothy Hollingsworth. Steel, glass, copper, stone and wood complete the look of this restaurant that merges the indoors with the outside. 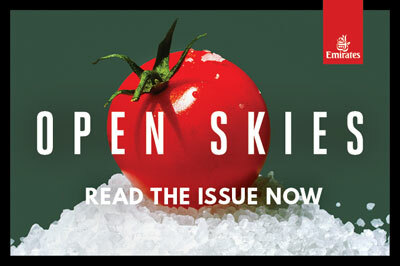 Museum restaurants are hardly a new trend, but LA elevates them thanks to its love of art and a healthy living ethos, by sourcing local seasonal produce and dining outdoors year-round. Downtown’s Art District harbours Hauser + Wirth Gallery, situated within the transformed 19th-century Global Mills flour complex. Within its configuration is the restaurant Manuela, named after one of the gallery’s Swiss founders. Roasted cauliflower, grilled local yellowtail, and garden mint ice cream are enjoyed in the bustling dining room, all brick, wood, and large glass panes. Designed by Matt Winter, it extends onto the patio that seamlessly blends into a 6,000-square-foot courtyard. Once a covered and abandoned warehouse, the now inviting open-air space is punctuated by sculptures and a 25-foot- tall live oak surrounded by low-water plants. The kitchen staff doesn’t have to travel far for last-minute provisions as there’s an urban garden with herbs, vegetables and a chicken coop – backed by a mural, no less. Coming soon to The Hammer Museum at UCLA in Westwood will be renovated café and restaurant concepts, key parts of its courtyard. It serves as a vibrant space for public engagement forums, art installations, as well as a concert venue for radio station KCRW’s Summer Nights. Part of architect Michael Maltzan’s multiyear renovation plan (to be completed in 2020) is to front a full city block of the museum’s existing building with the lobby and gallery spaces. Their sweep of floor-to-ceiling windows will dramatically increase The Hammer’s visibility and accessibility along Wilshire Boulevard, in hopes of ushering the busy world into a place of quiet, beauty, and art.